There are two main species of the cockroach to Great Britain. There are two main species of cockroach found in Great Britain however other species can be found. The commonly found species are the Oriental cockroach which is dark brown in colour and approximately 30 mm long and the German cockroach which is a lighter almost yellowish brown colour and about 12mm long. Both of these species have bodies that are divided into three sections. Both species have long antennae protruding from their heads (at least as long as the body), and very spiny legs. When a heavy cockroach infestation occurs, there can be particularly distinctive sour odour present. Usually, cockroach infestations will be detected at night when they are most active as they are nocturnal. Of the two species, the German Cockroach is the most agile and is capable of climbing smooth vertical surfaces. Whilst Cockroaches are quite able to survive for months without food they will die if they have to go without water for more than a few days. Cockroaches are usually found to the inside of buildings in areas such as cellars, basements, kitchens, bakeries and heating ducts, with the German Cockroach preferring a warmer environment. Feeding on refuse, faecal matter and almost anything that becomes available in their environment. 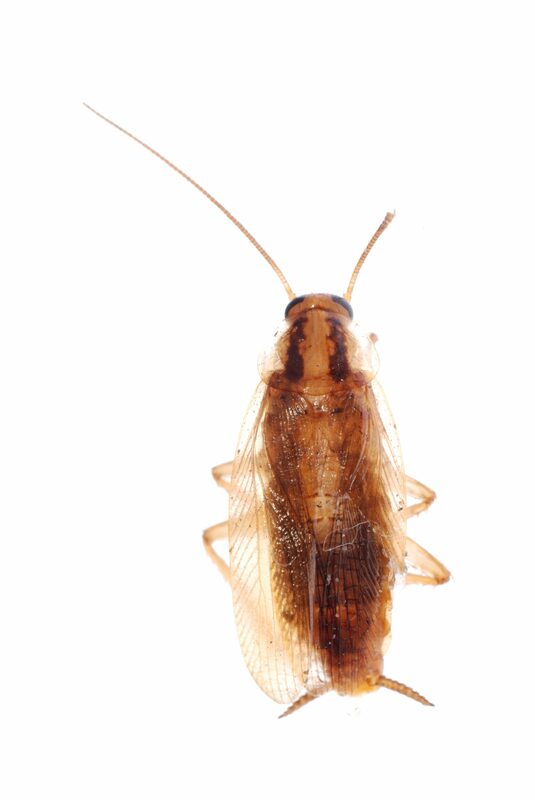 Due to the nature of how the cockroach lives and breeds, infestations can be extremely difficult to control and good housekeeping and hygiene routines are therefore extremely important. Treatment is undertaken by removing any infested commodities and then the application of residual insecticide sprays and dusts to cracks, crevices, floorboards, skirting boards etc. Gel baits can also be very effective. Treatments may take a number of weeks due to the emergence of nymphs from aged egg cases.